St. Petersburg was built to be an imperial capital, one of grandeur, and as a monument to Russia’s greatness on the European stage. Less than three centuries ago Peter the Great began construction here. It was his grand city on the Gulf of Finland, one filled with palaces, cathedrals, museums, parks, canals, and squares. It was his “window to Europe,” and for over 200 years it was Russia’s imperial capital city. This is the city where Bolsheviks stormed the czar’s Winter Palace in October 1917, bringing Communism to power in Russia. It is also the city, then known as Leningrad, that heroically survived the famous 900-day German siege during World War II. Saint Petersburg (Санкт-Петербург​) is a federal city of Russia built on the Neva River at the Gulf of Finland on the Baltic Sea.Other names names for this grand city have been Petrograd (Петроград, 1914–1924) and Leningrad (Ленинград, 1924–1991). It is often called just Petersburg (Петербург) and is informally known as Piter (Питер). It remains common for older citizens to refer to the city as Leningrad. The year was 1703 when Tsar Peter the Great founded St. Petersburg. On land conquered from Sweden, he built his new capital along the delta of the Neva river, literally on swamp land. Designed from the start to be Russia’s capital, it remained so until 1918 when Lenin and the Bolshevik government moved the capital back to Moscow, in part to protect and distance themselves from Imperial influences still loyal to the Romanovs. Today Russians call this their “Northern Capital,” and it is a living monument to the lives and times of Russia’s past, the time of the Imperial Tsars. The city is beautiful, but sadly the history of how it was built and the cost in human life was no as pretty. Peter conscripted raw labour from Russian serfs, and he forced prisoners from the war with Sweden to construct his new city. It can be said that the life of luxury enjoyed by the Tsars and Russia’s nobles depended on the use of poor serfs and peasants. Saint Petersburg is a city of extremes–and that includes the weather. Winters in the north are very cold and the rivers and canals freeze over in winter months. However as if by magic, the city emerges from winter into a splendid great outdoor park for residents and visitors to enjoy. In midsummer it is as if everyone remains outdoors to enjoy the White Nights of this northern latitude, in a lander where the summer sun is never quite extinguished. St.-Petersburg is located along the Baltic sea, and that is why the climate remains damp and rainy. Temperatures are very cold in winter, and turn warm in summer. Locals say that the weather changes often. While there is no official rainy season, summer brings plenty of rain to the region. The most interesting period is the “White Nights” in early summer when there is only faint darkness in the night, the sun remains present, and at times the body finds it hard to sleep. Saint Petersburg is filled with classical living monuments as St. Isaac’s Cathedral, Kazan’s Cathedral, Peter and Paul’s Fortress, the Admiralty, Russia’s Hermitage, and Smolniy Cathedral and was the capital of the Russian Empire for more than two hundred years (1713-1728, 1732-1918). It is Russia’s second largest and Europe’s fourth largest city (by city limit) after Moscow, London and Paris. 4.6 million people live in the city, and over 6 million people live in the city’s vicinity. The Winter Palace contains Russia’s largest museum, the Hemitage, which houses more than two and a half million exhibits. Since Peter the Great, Russian rulers purchased many major works of art, but it was Catherine The Great who acquired complete collections from the auction houses of Europe. In 1764, Catherine the Great bought 250 pieces of art for her private hermitage. Having the collection housed in her winter palace, she allowed few to see these fine pieces of art. During the Russian Revolution, in the early part of the 20th Century, the museum was considered public property and most private art collections were nationalized, making this museum the largest art collection in the world. Winter Palace was the winter residence of the Russian tsars (built between 1754 and 1762). The palace was designed by Bartolomeo Rastrelli in Rococo-style. The Palace is now part of a complex of buildings known as the State Hermitage Museum, which holds one of the world´s greatest collections of art. The artwork, the rooms, the statuary, the marble, the stonework, malachite floors, the many huge vases—the very size of the palace!—are dazzling, and unforgettable. For many, such opportunities only exist in books or on the Internet. When Russia was closed to tourism outsiders had no opportunity to see the treasures of the Hermitage. 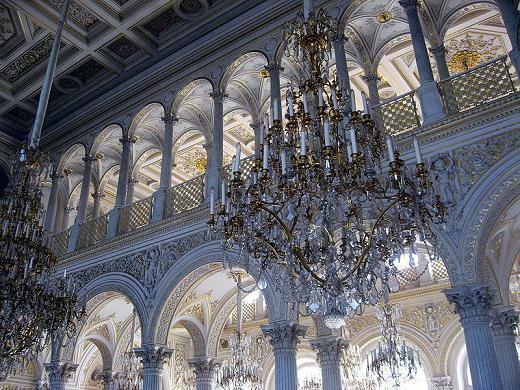 The Hermitage is one of the largest and oldest art galleries in the world and has an amazing account of human history. Located on the picturesque Neva River and held within six palace buildings, The Hermitage is an example of the amazing power of human creativity. The Winter Palace’s countless opulent rooms, filled with gold and priceless artwork, were a powerful reminder of the vast separation between the condition of the ruling families who lived there and that of the rest of the population. This was the site to historic events such as Bloody Sunday in 1905 and the October Revolution in 1917, as well as the Communist rallies and anti-government demonstrations held much later on. A tourist could spend several days walking through the corridors of the Hermitage and still only see a fraction of its treasures. So how did the Hermitage get its name? The letter Э is one of those very hard to pronounce letters in the Russian language. It’s distinctive sound means that it is used only selectively. Sla-va Bo-gah (Thanks to God!) because it’s a sound not made in English and hard to replicate correctly. A check of my large Oxford dictionary has only 4-1/2 pages of words beginning with Э. Now that is not the least as there are other letters with fewer pages. Among them are the letters ю with 1-1/2 pages, the letter й does have a page but there are only 14 entries listed. Meanwhile the letter ё is so scarce that it doesn’t have a page of it’s own and instead the few Russian words beginning with this letter are scattered in among the words starting with е. You may also be surprised to learn that the lonely letter ы, so useful at the end of words when forming plurals, doesn’t rate a single entry in the dictionary! But I digress. You’re no doubt wondering why Catherine the Great named her palace (the Winter Palace) as the “Hermitage.” Phonetically, “Ehr-mah-tahzh” may not be the best weird combination of letters to speak this correctly but should be sufficient. However, how or why did she give the Winter Palace this name? Catherine was a collector of art. Were you to tour the 10,000 rooms of the Hermitage today, you’d quickly discover that you were inside the largest art museum in the world. In those days French was the language of the Russian royalty and Catherine loved to shop Paris for the world’s best art. She knew how to come home with her bags full of the finest art from all over Europe. Catherine was also a collector of men, lots of them. Young and handsome were her favourites naturally. A married man was fair game in her eyes too, and more than one beautiful young wife or maiden was shipped off, banished to some outpost like Kherson or Odessa, etc, so that Catherine could concentrate on her male conquest. She went through men like a knife through hot butter. Often in her prelude to conquest, she would engage upon a series of letters to the men on her target list. She loved to describe herself as “alone” and she often wrote that “only myself and the mice” were there to enjoy her palace filled with art. Now of course that wasn’t true as the entire Russian government was housed on Palace Square. Hundreds of servants maintained the palace and royal staff assisted in her daily duties. In describing her supposed loneliness to suitors she habitually used the French word, hermit, to describe herself and her palace as a place for hermits, a Эрмитаже (Hermitage). As the late Paul Harvey would say, now you know the rest of the story. “The Russian Ark” was a film recorded in one continuous shot inside the Hermitage, showed thirty three rooms in the palace and featured over 2,000 actors in period costumes and three live orchestras for the soundtrack. One of our favourite Hermitage destinations, available by appointment only, is a visit to the Gold Rooms in the Treasure Gallery, which contains ancient gold jewelry and artifacts, including pieces from the reigns of Peter I and Catherine II. In a testament to the goldsmiths’ exquisite craftsmanship, many pieces on display were done in miniature. While amazing to see, photos are not allowed. Near by the Winter Palace and the Hermitage is the Russian Admiralty, with its needle-shaped, gold-plated tower, is one of the city’s most famous landmarks, its grand architecture depicting the emergence of Russia as a naval power and the marvellous Isaaks Cathedral has the third largest dome in the world. Twenty four thousand tree stumps were used for its foundations and it can accommodate a congregation of 14,000. The Admiralty is across the street from the Hermitage. The original Admiralty was one of the first structures to be built in St Petersburg. It was designed to be a dockyard, where some of the first ships of Russia’s Baltic fleet were built (some with the participation of Tsar Peter himself who, was an expert in shipbuilding). The Admiralty was also fortified to be an extra defense for the newly acquired territory of the Neva delta. Shipbuilding in the Admiralty went on till 1844 and since 1925 the Admiralty has housed the Higher Naval Engineering School. 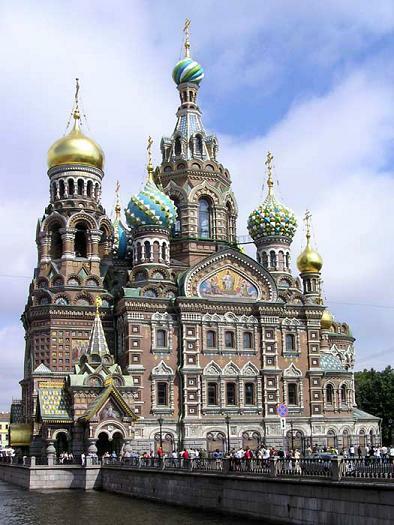 The Peter And Paul Cathedral was the burial place of the Tsars and it contains the marble coffin of Peter the Great. Tsarskoye Selo (“Tsar’s Village”) is a former Russian residence of the imperial family. It is now part of the town of Pushkin and of the World Heritage Site Saint Petersburg and Related Groups of Monuments. In 1708, Peter the Great gave the estate to his wife—future Empress Catherine I—as a present. It was Catherine who started to develop the place as a royal country residence. Her daughter, Empress Elizabeth and her architect Bartolomeo Rastrelli were largely responsible for the building of the Catherine Palace. Later Empress Catherine II of Russia and her architect Charles Cameron extended the Palace building what is now known as the famous Cameron Gallery. Currently, there are two imperial palaces: the baroque Catherine Palace with the adjacent Catherine Park and the neoclassical Alexander Palace with the adjacent Alexander Park. By the end of the 18th century, Tsarskoye Selo became a popular place of summer residence among the nobility. Tsarskoye Selo (“Tsar’s Village”) is a former Russian residence of the imperial family. It is now part of the town of Pushkin and of the World Heritage Site Saint Petersburg and Related Groups of Monuments. In 1708, Peter the Great gave the estate to his wife—future Empress Catherine I—as a present. It was Catherine who started to develop the place as a royal country residence. Her daughter, Empress Elizabeth and her architect Bartolomeo Rastrelli were largely responsible for the building of the Catherine Palace. Later Empress Catherine II of Russia and her architect Charles Cameron extended the Palace building what is now known as the famous Cameron Gallery. Tsarskoe Selo is also called Pushkin today, after the famous Russian writer and a poet who is considered to be the farther of modern Russian language. You may have read his famous poem of Evgeny Onegin. Interestingly, Alexander Pushkin foretold the circumstances of his own death in the poem. Both Alexander and the hero of his story, Evgeny, die in a dual over a woman they love. Peterhof ( or Peter’s Court in German) is an island covered with palaces and gardens. Peter the Great selected this island as his home because it was located next to the Kronshdadt naval base. Peterhof is famous for the Grand Cascade and Samson’s Fountain. The cascade of fountains resembles those of the Louvre, and the Statue of Samson conquering a lion represents Peter’s victory over Sweden (the lion is a symbol of Swedish monarchy). Germans occupied Peterhof during the Siege of Leningrad and destroyed many of its pieces of art. Since then, many have been recovered and restored. Peterhof is one of the most famous sights in St. Petersburg and one of the most interesting museums of the Russian Imperial era. The Fortress was constructed during the Northern War, but it has never seen a real battle. Destiny had a different design for it. Instead, The Cathedral of Peter and Paul’s Fortress was used as a burial place for Russian tsars. 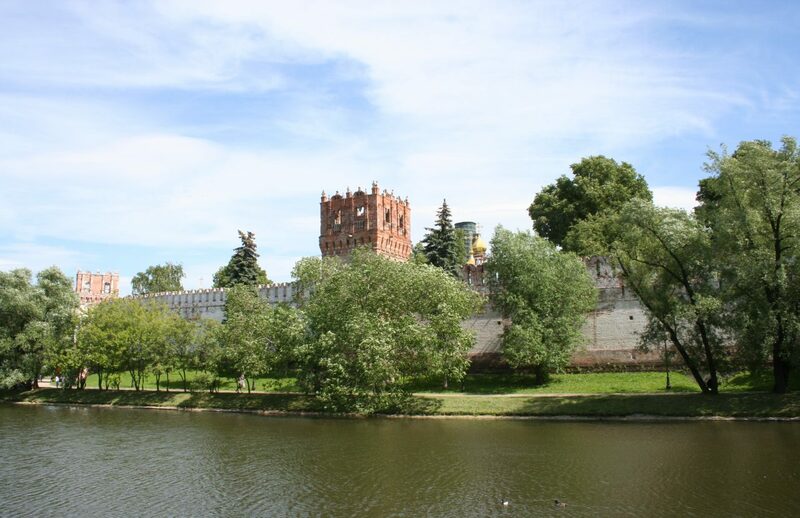 The Fortress itself was used as a prison for high-ranking political prisoners under the tsars. The Bolsheviks used it to prepare an attack on the Winter Palace in 1917, which resulted in 70 years of communist rule. Saint Isaac’s Cathedral is one of the most interesting of Russia’s great Cathedrals. Rebuilt four times, it was first constructed in 1707 during the reign of Peter the Great. And the construction of the forth one was connected with the life of the famous French architect Auguste Montferrand who was building it for 40 years. May be it took so long to finish the work, because it was predicted to the architect that he would die as soon as the Cathedral was built. And indeed, Monferrand passed away a month after he finished the creation to which he dedicated all his life. One of the most colourful churches in Russia is the Cathedral of Saviour on Spilled Blood, also known as The Resurrection Church or the Church of the Resurrection of Christ, was built on the spot where the Russian Emperor Alexander II was murdered. It attracts people with its exuberant decoration, its five onion-domes are covered with jeweler’s enamel a total area of 3280 square feet. Church on the Spilled Blood; Фотo Шумин А. А. This magnificent church was designed in the period’s Russian architectural style and reminds a bit of St Basil’s Cathedral in Moscow. Its peculiar multicolored exterior makes the Church stand out among other St Petersburg architectural buildings which are characterized by strict proportions and color combinations.